Fabulous overdriven toneswith great headroom and power. Fine build. Despite its size, the Gain Master packs a serious punch. The build quality on offer is of excellent quality. The controls are easy to work with. It may be pricey, but the Gain Master offers some of the best tone you're ever likely to get. This amp - along with its sibling the Studio Pro 35 - is part of a recent range of lower-powered heads and combos from Californian amp maker Two-Rock, which began with 2005's Jet. While there are enough similarities to question the point of three products that seem to overlap, Two-Rock insists they are wholly different beasts. "It doesn't take long to work out how much clean gain you need to cascade into the drive side to maintain the right clean-to-dirty ratio." "The Jet followed the lineage of the Custom Reverb Signature and is a self-contained 'grab and go'," the company's general manager Mac Skinner tells us. "Where the Gain Master doesn't have reverb, the Jet can do that. The Jet has a different clean circuit than the Gain Master and Studio Pro, and a different lead circuit than the Gain Master. "Tonally they are all different. The Gain Master was designed to be a lower wattage, dual-channel, classic amp design, modelled after our limited edition TS-1." The cabinet is constructed from finger-jointed Baltic birch, ensuring stability and strength. 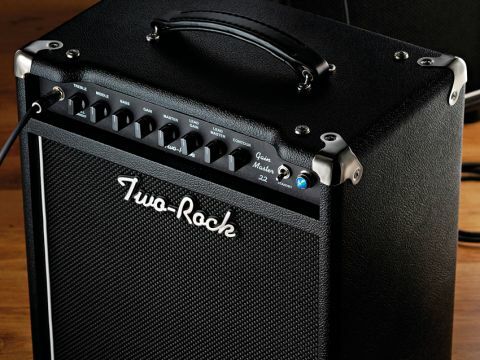 Its small size lends the amp the stated 'grab and go' vibe. The 6V6-loaded Gain Master 22 is distinctly different. Only the treble knob of the three- band EQ has a pull switch and, instead of the front-mounted reverb loop of the Sutdio Pro 35 there's gain and master plus lead gain and lead master. The contour control is retained. At the rear we see sockets for the amp's footswitch (channel and EQ bypass), passive effects loopa nd speaker outs. The amp's drivers are the 12-65B made by Warehouse Guitar Speakers. "We have found it to be a perfect match to the smaller amps," states Skinner. Other speakers are available as extra cost upgrades: namely, Eminence's TR12-65 or a Celestion G12-65, the latter of which "sounds amazing", according to Mac. The Gain Master's channels are governed by two sets of gain and volume controls. They're interactive, which means a balancing act between clean and dirty. But it doesn't take long to work out how much clean gain you need to cascade into the drive side to maintain the right clean-to-dirty ratio. You can push the clean gain pretty far without that channel mushing up, but it really adds to the sweetness of the ensuing lead tones. Contour works as on the Studio Pro and with no reverb we tried delay and chorus into the effects loop and switched the dirty channel for drive. The effects sound so 'present' and clear, and after years of setting the dirtiest sound, turning down for rhythm and up for lead with effects going in the front end, it was strange but satisfying to employ the amp's own superb overdrive. Using the footswitch's bypass option removes the EQ from the signal chain, boosting mids and gain. We loved it both ways, but felt we'd rather notch the amp's master up and take advantage of slightly better dynamics available with the EQ in. That said, ask tomorrow and you'll get a different answer! If the Studio Pro is the Hendrix/Mayer fingerprint, then think Robben Ford/Joe Bonamassa for the Gain Master. The clean tones are awesome - twinkling bright and chiming. But obviously this amp's more about drive; it's a darker, 'browner' sound than the Studio Pro, rich in middle and very smooth. And if you doubt 22 watts can cut it, think again. In a loud pub band situation it copes with battering-ram drums and World War III bass with ease. Over two grand for a low-wattage 1 x 12 combo without many bells and whistles is a lot of dough in anyone's book. Can it ever be justified? Let's answer that with another question: how much are you prepared to pay for the best tone you may ever have? We ourselves have forked out for a Two-Rock, so perhaps there's your answer. Please don't be deceived by its size and wattage. We've never heard such a huge sound coming from such tiny boxes; it's as though Two-Rock has performed some kind of magic trick that we've yet to uncover. If long, natural sustain in a dark tonal package is your thing, and you like to switch channels for clean and dirty, go for the Gain Master. This amp has been a revelation. Its bang per watt ratio is staggering but it's the glorious clean tones and singing leads that impress us the most. If you're in the market for a quality amp, you simply must try this. Like someone not a million miles from here, your wallet might go home a couple of grand lighter!